Those who travelled on European roads at the start of the eighteenth century must have met many unusual characters, but one character they might have met would have proven more unusual than the rest. He was a young man who claimed to be from the faraway land of Formosa (now known as Taiwan). There were just a few problems with the young man's claim of Formosan nationality. First, his skin was white, and his hair was blond. Second, he spoke fluent Latin (which wouldn't be a problem in and of itself), but he did so with a hint of a Dutch accent. Still, at the beginning of the eighteenth century most of the world remained a mystery to Europeans, and so they had no idea what a real Formosan should look like. They only knew that Formosa was a very distant land where the people undoubtedly had very different customs. And this man certainly had different customs. He occasionally babbled in an unknown language. He worshipped the sun and the moon. He slept upright in a chair with a lamp burning, and he ate heavily spiced raw meat. What better evidence of foreignness could anyone possibly want? But what really made his story compelling to the Protestants that he encountered was his dislike of the Jesuits. 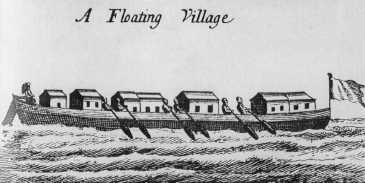 He claimed that he had been fooled into leaving Formosa by a disguised Jesuit missionary. His story played perfectly into the paranoid Protestant fantasy that the Jesuits were sending secret agents throughout the world to trick foreign nations into converting to Catholicism. Protestants figured that if this young man didn't like Jesuits, then he must be worthy of their trust. In 1702 the man from Formosa (he had no other name at that time) arrived in Holland and met a Scottish clergyman called William Innes who was serving in the English army. Innes probably saw through the deception right away, but he also knew a good thing when he saw it. He knew that it would help his career if he could present the church with an exotic convert. So Innes converted the Formosan to Anglicanism, baptised him with the Christian name George Psalmanazar, and brought him to England to meet the Bishop of London. When the Bishop heard Psalmanazar's strange story of Jesuit intrigue, he embraced him with open arms, as did the rest of British high society. The elite ladies and gentlemen of England treated Psalmanazar as an exotic curiosity. Even the Royal Society took an interest in him. Of course, Psalmanazar's story did not convince everyone, especially not the Jesuits. The Jesuit Father Fontaney, who was travelling through England at that time, challenged Psalmanazar to a debate which Psalmanazar accepted. But the debate proved inconclusive because Fontaney simply didn't know enough about Formosa to seriously challenge any of Psalmanazar's claims. For instance, when asked why his skin was not darker in color like that of other people from Asia, Psalmanazar replied that in Formosa the members of the nobility lived indoors and therefore had lighter skin than the laborers who worked outside. For all anyone in England knew, this could very well have been true. Soon Psalmanazar capitalized on his fame by publishing a book titled An Historical and Geographical Description of Formosa, in which he offered British readers an intriguing and sensational glimpse at Formosan culture. He claimed that in Formosa convicted murderers were hung upside down and shot full of arrows, that polygamy was allowed, and that every year 20,000 young boys were sacrificed to appease the gods (this latter claim was accompanied by a gruesome illustration of 'The Gridiron upon which the hearts of the young Children are burnt'). Psalmanazar also obtained an appointment at Oxford College to translate religious literature into Formosan. But doubts continued to circulate about Psalmanazar's true identity. These doubts became harder and harder to ignore until finally, in 1706, Psalmanazar confessed to his imposture, supposedly motivated by a religious experience that convinced him of the sinfulness of his deception. He spent the rest of his life working as an editor and a writer on Grub Street. At one point he even contributed a section about Formosa to a work titled Geography of the World, though this article, unlike his previous book, was truthful. Many years later, he wrote a long confession titled Memoirs of ****, Commonly Known by the Name of George Psalmanazar. This work was published posthumously in 1765, a year after his death. Who was Psalmanazar really, and why did he perpetrate this deception? Surprisingly little is known about his true identity. In his memoir he claimed to be of French Catholic heritage. He wrote that he adopted the life of a vagabond after growing bored with his studies as a young man. While on the road he discovered that posing as a foreigner was a convenient way to con funds from sympathetic strangers. But he claimed that the deception only rose to a greater level because of the ambition of the clergyman Innes. Given Psalmanazar's record of dishonesty, it is not clear whether this explanation is the truth, or yet another of his fabrications. Foley, Frederic J. The Great Formosan Impostor. Jesuit Historical Institute. 1968. Lynch, Jack. "Orientalism as Performance Art: The Strange Case of George Psalamanazar," talk delivered at the CUNY Seminar on Eighteenth-Century Literature, January 29, 1999. Swiderski, Richard M. The False Formosan: George Psalmanazar and the Eighteenth-Century Experiment of Identity. San Francisco: Mellen Research University Press, 1991.